I am writing you this letter today from a very special place. 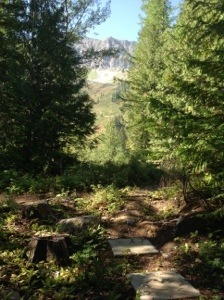 I am sitting on the concrete skirting that surrounds your memorial rock in a natural alcove that Mother Nature carved out in the forest, a short walk from the top of the Elk Chair on the mountain that you so lovingly referred to as your ski home. It is incredibly lush here; so beautiful, peaceful, and quiet. At this moment the only sound would be me crying. I am here by myself for a bit and I couldn’t contain my silent tears so the mountain you loved is hearing me cry out loud. The pain of missing you so terribly sometimes comes out this way, Will. My tears started when I woke this morning. My head was still on the pillow as I reached over to the bedside table for my Will heart necklace. I held it in my hands for a few moments staring at it as if I was looking into your blue eyes. Your ashes sealed inside the silver heart pendant that I cupped in my hands before I secured the necklace around my neck is the most treasured piece of jewelry I own. It is the first thing I put on in the morning and the last thing I take off before I crawl into bed. I have cleaned and shined it with my tears on many occasions and this morning was no different. 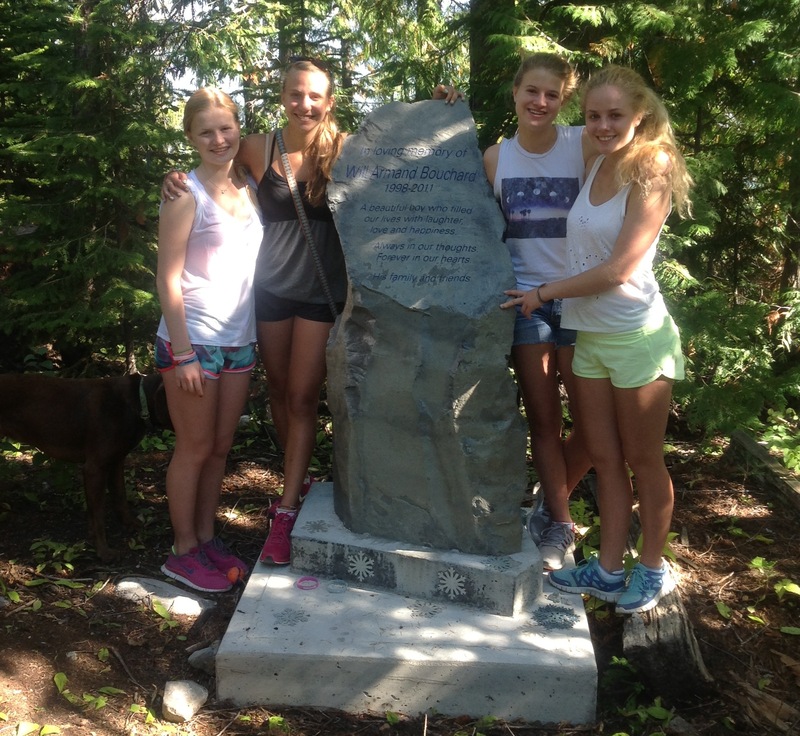 I am in Fernie this weekend for our second annual moms, daughters, and dogs hike to your rock. Claire, Sue, and Lisa and their “oh so pretty” daughters who I know you remember (Elsy, Sarah, and Tess) and, of course, the dogs (Sophie, Oakley, Bella, and our Finn) are sharing this special weekend with me. This year, however, your most special friend, Kathleen, and the closest girl I have to a daughter, is also here. I asked her if she’d come along as my “guest daughter” and in a while they will join me here to honour and remember you. But right now is my time with just you and as I sit here with my iPad ready to begin my letter to you I can’t help but notice the beauty that surrounds your memorial rock. Your rock in itself is incredible but where it rests is a little piece of heaven on earth. The ground is dark brown, rich and fertile, and still moist from the morning dew. The foliage and trees in all shapes and sizes and textures form a canopy protecting your rock somewhat from the elements that are part of a mountain climate. Some of the branches are tinged with yellow now as Mother Nature begins her transition from summer to fall. The ones directly overhead remind me of eyelashes as they flutter to and fro in the sunlight keeping me cool in the shade that they provide. There are still some glittery snowflake decorations hanging in the trees; remnants of the winter day the week before Christmas when Dad and I came here to specifically hang them. As I look down at my feet I notice bits of silver glitter that has mixed with the soil around your rock and my heart, even though my tears, somehow finds a reason to smile. I smile because I remember so clearly each day I visited your rock during this past winter while skiing. Inside my ski jacket pocket was a container that I filled with glitter and sparkles and each time I visited I would sprinkle them around your rock and the snow around it. Angel dust is what I called it. But what I notice most, Will, is the breathtaking view. This room with a view, your room here, is majestic and beautiful and a reminder that we are all so small amongst these huge mountains. However, your spirit and your presence here is much larger than all of us combined. I feel the warmth of your smile and I can hear your giggle (a giggle like no other and one of my favourite sounds ever), but what I long for more than anything else is to have you standing here with me, holding my hand. If only that was possible. What I will take with me down the mountain today are the countless memories of you at this place you loved and this view from your rock. Mother Nature was kind to bestow upon us this breathtaking view of Polar Peak. Your room with a view is beautiful, peaceful, and tranquil…. just like you. of us and never alone.